- They accept outside catering! While their own catering menu sounds pretty amazing, it's a huge plus that they allow you to bring in outside help. They do, however, require references for places they haven't worked with before. - The space itself is like a blank canvas, so you can really create whatever you want with it. They have no restrictions on decorators or florists, so it's really your space to create. - There is no extra ceremony fee. - The location is perfect for pictures -- it's located in Liberty State Park, so you have a lot of greenery plus beautiful views of downtown Manhattan. - There is plenty of ample parking for guests with cars. - The chairs are this dark wooden color. If you wanted delicate gold chairs with white cushions, they cost an extra $6.50 per chair, plus tax and delivery! - There may be extra costs if you don't use their house linen (which is grey and white). 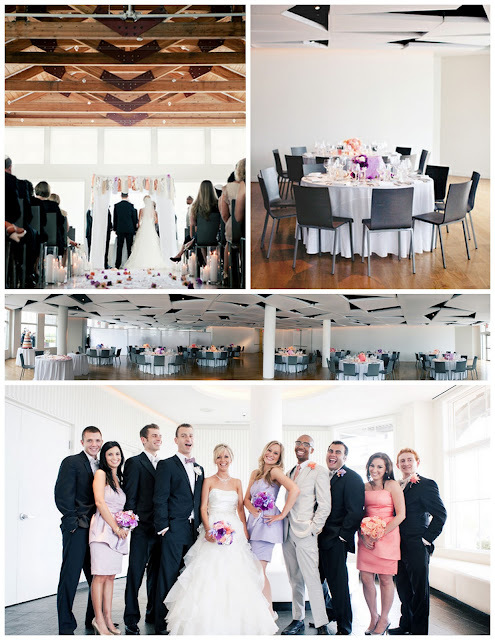 - The venue itself is located in Liberty State Park, which is right off the Turnpike. Convenient for our guests who are driving in, but may be an issue for our New York City guests who would be using public transportation. - You can only come in to set up your event 2 hours before the start time. While this should be enough time it may be cutting it close depending on how dramatic your set up is. - Because the space is so minimalist, you may need to spend extra in filling it up with candles, flowers and other ornaments so that it doesn't look too sparse. - Saira's fiance's best friend is having his wedding there this summer -- what are your thoughts about sharing wedding venues with close friends? - The space is so elegant that we really don't think you need to dress it up much. All you really need are flowers for the table and some well placed candles. - There are no extra charges for tables, chairs, or linens. - The timing of the event is very flexible. You can choose the start and end time, and there is no one there to strictly force you out. - There is no extra fee for holding the ceremony at the venue. - They allow outside caterers, and are not as strict when it comes to working with new places. - The location is extremely convenient for those traveling from New York, as it's only a few blocks away from the train station. - You can have your event here any time, rain or shine, as there is no outdoor space. - Because the venue is located in Newark, parking can be incredibly difficult. Your options are to make your guests pay for parking, do valet parking for around $3,000, or hope that your guests stay at a hotel (they partner with a number of hotels that provide shuttle service). Transportation to and from the hotel / train station is incredibly important, as you don't want your guests straying around Newark late at night. - The costs are on the higher side, although there appears to be some flexibility. Unfortunately, we haven't been able to get a set price per head yet, with the event coordinator asking us to name a number rather than giving us an approximate amount. - While the Museum itself is not very grand, the Engelhard Court is very beautiful and airy. - The garden is a true surprise. It has a giant cherry blossom tree in the middle, and is surrounded by subtle structures around the perimeter. Weather permitting, your ceremony and cocktail hour would take place outdoors in the garden. - The Museum's required rental fee, plus a set-up fee, is actually quite affordable. Of course, these costs don't include catering, but even so, it won't burn a hole through your pocket. - We love that you have access to the Ballantine House. While this space will not be open to the public, your wedding party plus a few special guests are given space to get ready and enjoy a few relaxing moments before the big day. - The staff seems to be incredibly helpful and on top of things. You can tell that an event here would be incredibly organized and well-timed. - The Engelhard Court is a beautiful space, but with 250 guests, it will be very cramped. While it can accommodate approximately 250 people, we think the space is better suited for no more than 200 guests. - If you plan on having your ceremony here, but it ends up raining, your Plan B is to hold the ceremony in an auditorium -- definitely not the ideal romantic setting. - Similarly, if it rains you no can no longer use the garden for cocktails. Instead, you would use the space surrounding the Engelhard Court, known as the Vaulted Gallery, which will do the trick, but could lead to a more cramped and difficult to navigate cocktail hour. - They are incredibly strict with outside caterers, although they do allow them. Apparently there is a bit of a vetting process, but hopefully your caterer will understand that once they are approved, it will make subsequent weddings at the Museum much more convenient. - You may incur additional fees for tables and chairs. While they provide white folding chairs for the outdoor ceremony and gold chairs for the reception, they only have 160 gold chairs, which means you'll have to supplement the rest out of pocket at $5.50 a pop. Okay dolls, now that you have a little information about our current contenders, what do you think? Have you had any experience with these venues and have some words of wisdom to share with us? If you could choose one, what would you do? 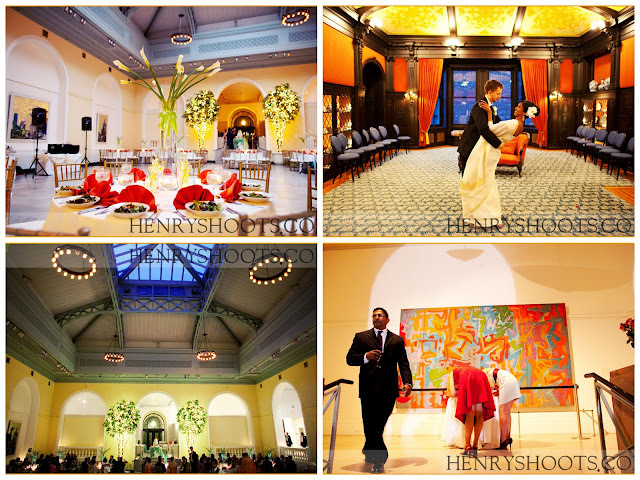 Also, now that you have a glimpse into Saira and Henry's wedding style, do you have any other recommendations for the New York / New Jersey area? We would love to hear what you think! ooh I love #1! Being able to bring in outside vendors is key. 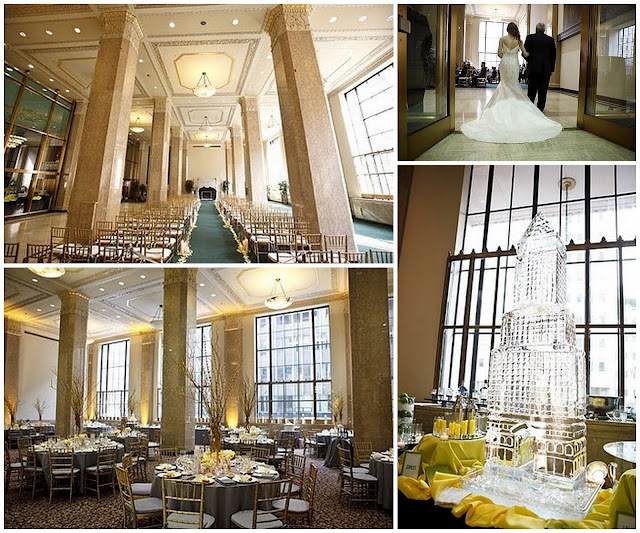 My friend Emily went to a wedding there, and she says the views of NYC are awesome, the indoor and outdoor spaces are sleek, modern and beautiful. The wedding was really fun, and it was nice to be able to go indoors and outdoors seamlessly. The cocktail party was in the top level. Food was really good (who knows where it was from). I really like #1 as well!